Bend the cosmos to your will! For SAP data and non-SAP data alike, this comprehensive resource spans universe creation to universe publication. Learn to build single- and multisource data foundations and business layers and to convert UNV to UNX using the new Information Design Tool. Using step-by-step instructions and guiding screenshots, explore the important Information Design Tool features and functionalities that will put intelligent design within your grasp. Explore its interface and find tips to design and manage universes that fit your needs. Begin with a conversation on the fundamental role of the semantic layer and then move into the pillars of universe design: the data foundation and the business layer. Connect to any relational data source or OLAP cube with your universe, and make sure you’re using the right parameters and access methods to retrieve enterprise data from SAP systems. 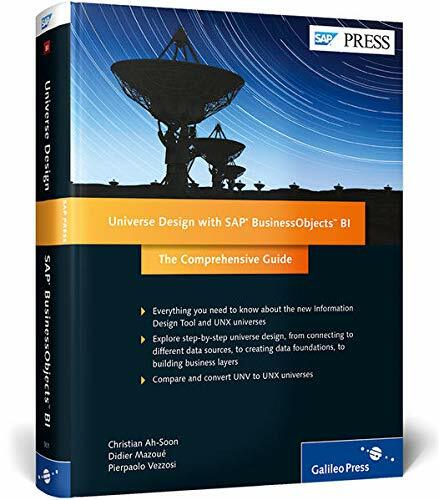 Learn how to make universes available for consumption by SAP BusinessObjects BI tools and for collaboration with other designers. Differentiate between universes created with the Universe Design Tool and Information Design Tool, and learn how to convert UNV to UNX. Christian Ah-Soon has worked for SAP BusinessObjects for 13 years as a program manager on transversal areas like administration, security, internationalization, and installation. For the last major release, SAP BusinessObjects BI 4.0, he worked on the Semantic Layer team. Christian holds a Ph.D. in computer science and graduated from TELECOM Nancy.